The Special Crime Investigation Cell of the Chandigarh Police today arrested three youngsters, who allegedly fired shots at Barista, a coffee bar at Sector 35 during the night of December 22. DSP (CID) Satbir Singh told TNS that the accused, Harkirat Singh alias Badal of Phase X, Mohali, Rahul Dev of Ekta Vihar, Baltana and Gurpreet Singh Chahal of Baryali village in Mohali district, were arrested from near Barista in Sector 11 following information. 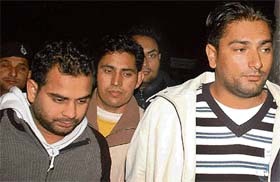 The accused of Barista firing in Chandigarh on Saturday. 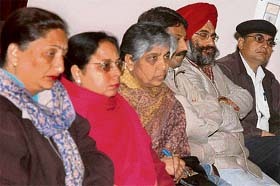 The revised municipal electoral rolls released on December 28 have come under cloud after many residents as well as political leaders have alleged that many bogus votes were included in the new rolls while the names of genuine voters were deleted from the lists by officials involved in the survey under the influence of some councillors. Not a single public authority in Chandigarh has displayed in its office the 17 proactive disclosures which are a must under the Right to Information (RTI) Act. Required to be physically displayed at all offices within 120 days of the passing of RTI Act on October 12, 2005, the disclosures under Section 4 I (b) are yet to happen. The Estate Office has failed to enforce its own order to penalise the traders in Sector 17, who have paint or whitewash the facades of their buildings. 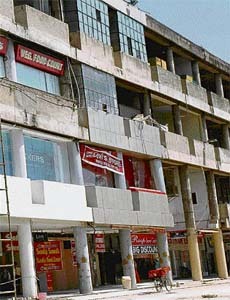 With a view to improving the outlook of the commercial sector, the Estate Office, through a public notice, had warned of action against those who did not clean the facade of their buildings. Glazing the facade is also a violation of the rules. The traders had also been asked to remove the advertisement panels other than those prescribed under the architecture control sheet. The SAS Nagar district administration has proposed the construction of a 10 feet wide link road to the Jayanti Majri temple in Chandigarh’s periphery. Festive celebrations marked the birthday of Guru Gobind Singh here today. 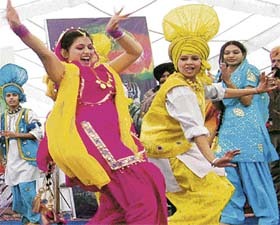 The Gurpurb was observed with traditional fervour, zeal and gaiety all over the city. 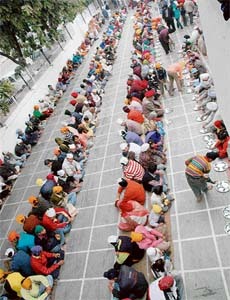 Devotees partake of langar on Gurpurb at Gurudwara Patshahi 10th in Sector 8, Chandigarh on Saturday. The Chandigarh traffic police today organised a conference on road safety and school area management at the Sector 29 Traffic Auditorium, in which principals from various local schools participated. Kharar MLA Balbir Singh Sidhu has urged the government to provide adequate compensation to farmers whose land was being acquired for the airport being set up at Mohali. High on alcohol, a homeguard posted with the Sector 31 police station, created nuisance at Palsora this evening. 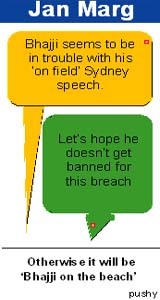 Gurmukh Singh, the guard in question, reportedly screamed at people, harassed them and stopped vehicles on the pretext of checking. The local police today arrested a Mauli Jagran resident and claimed to have recovered five stolen mobile phones and other articles from him. According to the SHO of the Manimajra police station, inspector Hari Kumar, 22-year-old Pawan Kumar, alias Paua, was arrested from a naka near the BSNL exchange here this evening. Sunny Sethi (18), a resident of Dashmesh Nagar, Nayagaon, was arrested by the Mohali police today for allegedly murdering Saggu Ram, a Chandigarh resident, almost a year back. According to Nayagaon SHO Gurjeet Singh, the accused surrendered before the police today and admitted to have killed Saggu Ram on the night of January 31, 2007. Salim (15) was crushed to death while Monu (10) was seriously injured when a tractor trolley hit their bicycle near Barwala here today. The deceased was a resident of Deha colony at Barwala. According to police, the victims were returning home when a tractor trolley, coming from the backside, hit them, crushing Salim under one of its wheels. 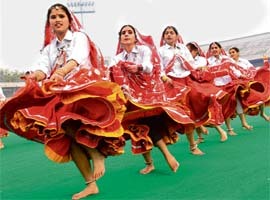 Panjab University has finally thought for giving importance to extra-curricular activities in studies. Taking a cue from the West, the university is all set to keep in mind the interests and capabilities, apart from studies by innovatively flexing the syllabus. Students and staff of Paragon Senior Secondary School, Sector 71, here celebrated their 26th annual day today. Jasjit Singh Bunny, chairman of the Cooperative Bank, Punjab, was the chief guest on the occasion. Madhur Bhandarkar’s story is no less than a film’s script. Sprinkled with multiple flavours of life, it comes closest to a delicious drama - set in days when the now-famous filmmaker used to wipe the floor beneath actors’ feet, chalk mark sets, and even stand guard as costume designers draped the cast. Haryana Chief Minister Bhupinder Singh Hooda yesterday went on an inauguration spree announcing various sops for a cross section of the society. Addressing a function organised by the National Blind Federation to mark the 199th birth anniversary of Louis Braille at Panchayat Bhawan in Chandigarh. Rajesh Kumar, a resident of Dera Bassi, here, has approached the Punjab state information commissioner, complaining against the Dera Bassi municipal council alleging that the council’s executive officer has not provided him with the information he had asked for over two months back. As part of a series of ‘Know Your Army’ exhibitions that the Western Command proposes to hold at different locations on the occasion of Army Day, the first such exhibition began at Ambala today. The contingent of Orissa was awarded first place in the march past competition held during the opening ceremony of 53rd National School Games, held at the Sports Complex, Sector 42, here, today. Starting on a winning note, the Chandigarh hockey boys’ team defeated Himachal Pardesh team by four goals without conceding a single goal 4-0 in the under-17 (boys) opening match of 53rd National School Games held at Sector 42 turf, here, today. GN Khalsa College for Women, Ludhiana, won the Panjab University Inter-College Softball tournament for Women for the session 2007-08. The meet held at PU grounds here, today. GGS College for Women, Chandigarh, secured second place. Adviser to UT Administrator Pradip Mehra today inaugurated a free heart check-up camp held at Government Model Senior Secondary School, Sector 21. The camp was organised by Citizens' Association, Sector 21, and the Gianwati O.P. Jain Memorial Trust. The advanced eye centre of the PGI today got a photo gallery, upgraded library and doctors’ lounge. These facilities were inaugurated by Dr Juginder Luthra (USA) and Dr Omi Gupta (UK) in the presence of the faculty of the centre, including the head of the department, Prof Amod Gupta.